If you have the need to add light effect dots or shapes to your iPhone photos, I have found a new option. An option that is offering more tuning than is found in other Bokeh light apps. 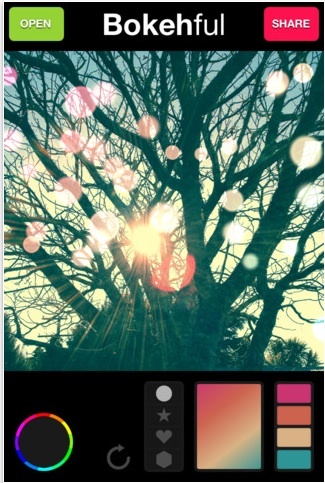 Bokehful still has the randomness of the dot or shape location on the photo, but lets you have better control of the placement by painting with your finger. Choose a shape to have the lighting appear in on your iPhone photo. Then, choose the colors and gradients for the lighting. Bokehful makes the process quick via it’s pickers and pre-assembled light color groupings. You can even choose the direction the gradient effect is applied. When done, the image is saved at full resolution, or share with others through Instagram, Facebook, Twitter or as a eMail attachment. As an extra, this is a universal app so when you buy for your iPhone, you can install on your iPad to use at no extra charge too.